Powers/Abilities: Madman had superhuman strength comparable to the Hulk's (Class 90-100), as well as size-changing abilities. His strength seemed to increase with his size, his peak form being about eight feet tall. Madman initially struggled with his dual personality of Phil Sterns, both of whom were in control of their body at different times. However, the Phil Sterns personality now seems completely submerged beneath that of Madman. He was also a very intelligent scientist, with knowledge in nuclear physics and robotics. History: (Incredible Hulk II#367 (fb)) - Phil Sterns, the brother of Sam Sterns (better known as the Leader), attended the same graduate school as Bruce Banner. Though intelligent, Phil always hovered toward the bottom of the class, but admired the genius of Bruce Banner from afar. After graduation, Sterns tried to get military funding to support his research in using gamma radiation as a weapon. However, the military supported Bruce Banner instead. Jealous of his idol, Sterns spent years trying to duplicate the conditions to give himself powers like the Hulk. The process drastically twisted his mind as well as his body. His personality was splintered between Phil Sterns and a new persona called the Madman, a superhumanly strong, size-shifting monster. His Madman personality became stronger, asserting more dominance over Phil until finally, Phil found himself a servant of his deranged alter ego. (Incredible hulk I#366-367 (fb)) - The Leader became aware of what his brother had become, and decided that Madman was a potential threat and must be terminated. However, he could not find it in himself to kill his own brother. His personality was splintered between Phil Sterns and a new persona called the Madman, a superhumanly strong, size-shifting monster. His Madman personality became stronger, asserting more dominance over Phil until finally, Phil found himself a servant of his deranged alter ego. (Incredible Hulk II#362) - Phil Sterns, while on the job at Yucca Flats, approached Bruce Banner, who was using the alias "Bruce Bancroft" and working as a janitor in the facility. He was surprised that a janitor showed a high level of understanding of the technology. (Incredible Hulk II#363) - Phil Sterns approached Bruce Banner at work again, telling him that he was aware of Banner's true identity, and offered his assistance to Banner. He would give Banner access to the machines and equipment so he could search for a way to rid himself of the Hulk, and in return, Banner would look over Sterns' science work for errors. (Incredible Hulk II#364) - The Madman personality created a poison that could kill even the Hulk. He ordered his Phil Sterns personality to inject the poison into Bruce Banner. The Phil Sterns personality objected, not wanting to take part in murder, but the persona of Madman prevailed, and Phil Sterns injected the poison into Bruce Banner with what appeared to be just a friendly pat on the shoulder. (Incredible Hulk II#366) - Madman watched the Hulk from a window at Yucca Flats. As he departed, an armed guard stopped him, and Madman promptly killed him. (Incredible Hulk II#367) - The Hulk, nearly dead from poison, was transported to Phil Stern's apartment. He found the lair of the Madman in the caves beneath the apartment, and confronted Madman. 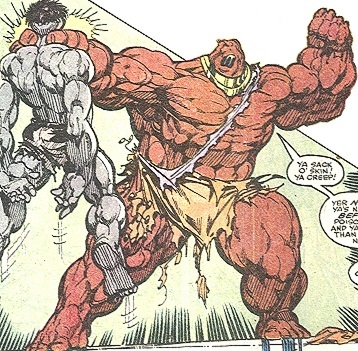 Madman used his size changing powers to bulk up to his maximum strength, and attacked the weakened Hulk. Madman beat on the Hulk mercilessly until the Phil Sterns personality regained control of the body. The personalities of Madman and Phil Sterns struggled for dominance. In a moment of strength, Sterns told Hulk of the location of the cure for his poison. After a period of struggle, the personality of Sam Sterns was completely submerged beneath that of Madman, apparently "killed" by his alter ego. However, the Hulk managed to inject Madman with his own poison from behind, and injected himself with the cure before Madman could do anything to stop him. He then left the cure just out of Madman's reach as he departed, leaving the villain to die. (Incredible Hulk II#408 (fb)) - Madman reached the cure in time and recovered. He later posed as a scientist in South America for the Red Skull�s New World order, tinkering with the android, Piecemeal, and gaining its loyalty. (Incredible Hulk II#407) - Madman came to Scotland to find Piecemeal after it escaped from the place of its creation. The Hulk had also come to Scotland on behalf of the Pantheon at the request of former Pantheon Member Perseus to investigate sightings of a monster in Loch Ness. Madman attacked Hulk from behind while the Hulk was fighting Piecemeal, and knocked him unconscious. (Incredible Hulk I#408) - Madman bound the Hulk in chains, tied him to an anchor, and threw him into the lake. He held the inhabitants of the lodge owned by Perseus hostage, allowing Piecemeal to use his absorption powers on them, and killed a hostage when Perseus attacked him. Later, when the Hulk returned to fight, Madman and Piecemeal both attacked the Hulk. 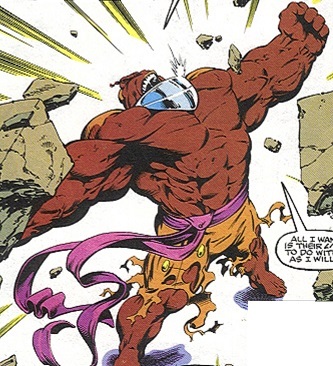 During the melee, Madman easily killed Perseus after the former Pantheon member tried to aid the Hulk. This enraged the Hulk, who punched Madman out of the lodge. Madman fled to a small airship and departed. After finishing off Piecemeal, the Hulk realized Madman had disappeared from the scene. (Incredible Hulk I#409 (fb)) - The Hulk caught up to Madman's airship, and smashed his way inside the craft. However, as soon as he did, Madman ejected and detonated his craft. (Incredible Hulk I#409) - Madman parachuted down over London, and took the prince captive. He then stood atop Big Ben and demanded that the UK's legislature declare him the new king of England. The Hulk again engaged Madman and rescued the Prince, while the British superhero called Motormouth sent Madman flying off Big Ben with her sonic scream. The Hulk and Madman fought onto London Bridge where the Hulk got the better of Madman, but before the fight could be finished, the bridge collapsed, and when the dust had cleared, Madman was nowhere to be found. (Savage Hulk I#1) – Madman was part of a large group of villains that attacked the Hulk at court in New York City. Comments: Created by Peter David, Jeff Purves, and Marie Severin. Put this one on the long list of characters I'm eagerly waiting to see return after a pretty lengthy hiatus.